The Klondike Highway is the key route connecting Whitehorse to Skagway, Alaska, and the turnoff can be found 15 to 20 minutes south of Whitehorse. This 156km stretch of road takes you through valleys, around glacier fed lakes and over a mountain pass while leaving the Yukon, briefly passing through northern B.C. and entering Alaska. Car manufacturers often extoll the virtues of the journey, and how it can sometimes be more important than actually getting to the destination. This was true of our experience on the Klondike Highway. We stopped at several pullouts, some being improvised*, while en route. 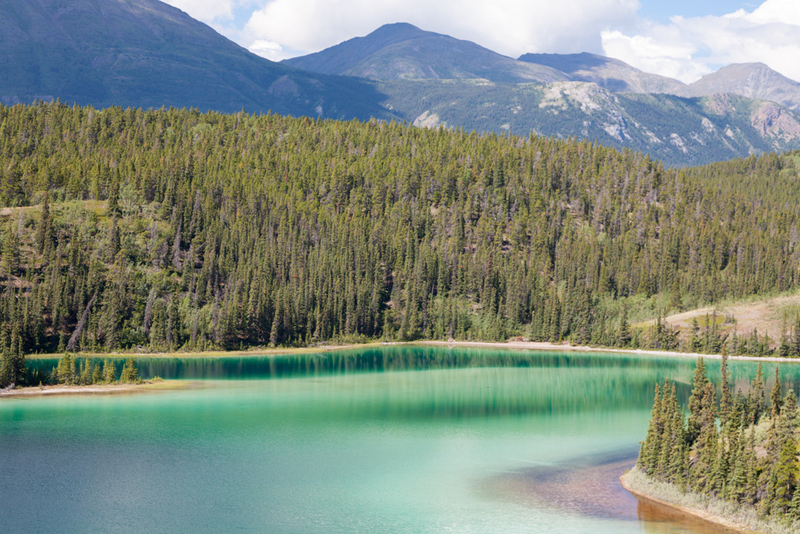 Our first stop was north of Carcross to take in aptly name Emerald Lake. Other stops included breakfast at the Sourdough Bakery and a walkabout in Carcross to visit the townsite & shoreline of Bennett Lake, and pullouts at Bove Island, Tagish & Summit Lakes, as well as Bridal Veil Falls. * Big city folks learn to stay away from busy highways for safety reasons. At 25,000 inhabitants, Whitehorse is the biggest thing going on in the territory, which means that highway excursions offer solitude, and plenty of opportunities to safely pull over without fear of accidents involving other vehicles. The Alaska border crossing at Skagway is just beyond the White Pass, and is at the beginning of a long 3,000′ descent to Skagway at sea level. We had to alternate between engine compression and brakes to keep our speed in check and avoid overheated brakes. Skagway would be our 2nd stop on our Golden Circle Route tour, and our arrival required a bit of an adjustment for us. Unlike most visitors to Skagway, we arrived via the back door while most visitors arrive as part of a throng at the cruise ship docks. As we ventured toward the grocery store downtown, the crowds got thicker until they became a safety concern with pedestrians stepping onto the roadway without paying any attention to oncoming traffic! Our lodging was not in Skagway proper, but off the beaten path a few miles down the road in Dyea, at the Chilkoot Trail Outpost. Here we would regain the tranquility that more often than not is a sought after feature of our vacations. 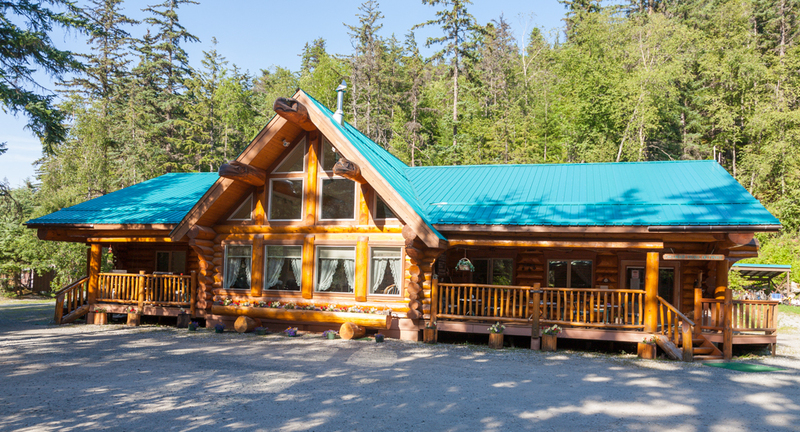 Our hosts at the Chilkoot Trail Outpost were Cathy and Fred Hosford, some of the warmest and most genuine inn keepers you will ever come across. We were clearly in Sarah Palin country, and while their political views were discussed fairly openly, they were never off-putting. While there are no restaurant options at the Outpost, they do offer a surf & turf basket that you can cook yourself at the BBQ out back. It was here that we met Ans & Niko from the Netherlands, and settled down for an enjoyable dinner with them. Dyea was an important gateway to the Yukon during the Kondike Gold Rush. It is possible to see limited ruins and the cemetary of the former townsite, however, there are no remaining building structures to speak of today. More importantly, Dyea is the gateway to the world famous Chilkoot Trail. The trailhead is only 800 metres from the Chilkoot Trail Outpost, and we committed a sin when we omitted to even set foot on the trail proper and hike in for at least a few kilometres to get a small sense of what 20,000 stampeders saw in 1898. Our first full day in the area allowed us to visit the tidal flats in Dyea in the morning. It is possible to drive past the parking lot on a jeep trail to get closer to the tidal flats, but our low clearance vehicle required some careful driving to avoid heavily rutted sections of the dirt road. We stood on the banks of the creek there and watched spawning salmon for quite a period of time. The sight of so many wild salmon, so close by, and in such clear waters had us transfixed. We also ventured over to the bay side to get a closer look at the shore birds. Unlike the salmon, they took off any time we got close enough to be able to take a picture! Our afternoon on this day was spent doing the White Pass Summit excursion on the White Pass & Yukon Route train. The 3 1/2 return trip to the summit of the pass was narrated, and the scenery held our attention during our entire ride up to the pass – if not for the natural beauty of the area, then definitely because of the sheer drop offs right next to the railroad track. This second day was capped of with a great supper at the Starfire Restaurant – an establishment that specializes in Thai cuisine. We had been told that Skagway pretty much empties out around 5pm, with cruise ship passengers making their way back to their vessels for dinner. With them gone, we felt like we had the townsite to ourselves, and only had to share it with the locals who made their way to the bars as their businesses closed for the day. Our third day in Skagway would have to be planned around the departure time of our ferry over to Haines. We were up early enough to do a hike on the Lower Dewey Lake trail. The loop was just under 6kms and easily completed within 2 hours. The air warmed up rather quickly by mid-morning, and Kelly enjoyed a dip in the lake while we were at the far end of the trail. 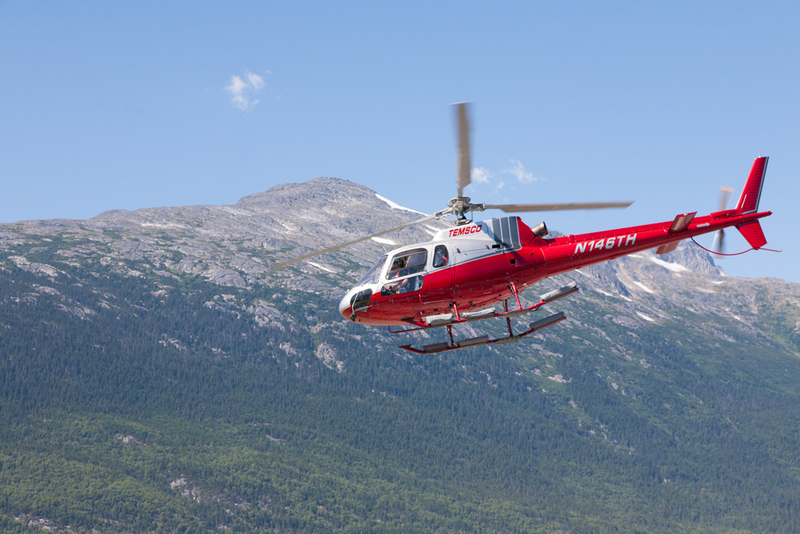 We parked on the pier close to the heliport for lunch, and watch groups of choppers – sometimes 5 at a time – leave with passengers to tour Lynn Canal and Glacier Bay National Park. We had time for a walk around town before having to report to the ferry dock for pre-boarding. The downtown core is dressed up to recreate the look and feel of the Klondike gold rush days. While the streets are paved today, wooden sidewalks and brightly painted storefronts all harken back to 1897. Unbeknownst to most travellers to this town, the majority of the businesses on the main drag are actually owned by the cruise ship companies. We made it a point to stop into shops with signs reading “family owned” to ensure that our tourist dollars stayed with the local economy. We enjoyed our stay in Skagway, but we were also looking forward to getting to our next stop – Haines, Alaska. You can read more about our journey along the Golden Circle Route here.